In this article, I am going to explore ways you can take an unhealthy food choice and improve it, perhaps even turning it into a healthy choice. We’re going to start by looking at bread and learn why enriched flours are nutrient poor and how we can make better bread choices. To understand why most bread today wreaks havoc in our systems, we need to learn more about how wheat is turned into the flour that becomes our bread. We know that consuming too much white sugar can be hazardous to our health, but many people are unaware that white flour reacts the same way in the body. It doesn’t taste sweet, but it does break down into glucose and create the same problems with blood sugar spikes that can lead to metabolic syndrome and Type 2 diabetes. In addition, white flour is devoid of any real nutritional value, so the calories we consume are empty and stored as fat. Whole wheat contains many nutrients including vitamins (vitamin E, vitamin B6 and niacin) and minerals (selenium, magnesium and phosphorus), as well as fiber, protein and antioxidants. It’s made up of the outside layer called the bran, a middle starch layer and the inside layer called the germ. Most of the nutrients are contained in the bran and the germ. Traditional flour making, however, strips away those two layers leaving just the middle or starch layer. This layer doesn’t have any fiber or nutrients to slow its absorption, so it is broken down and absorbed rapidly. (When you eat the whole grain, it is broken down and absorbed slowly and steadily without blood sugar spikes.) The processed version floods the body with too much sugar at once, spiking your blood sugar level and causing the excess sugar to be stored as fat. Once stripped, the wheat is then often bleached and a few synthetic lab-created vitamins are added to replace what was lost. This process is what enables it to be called “enriched.” But there is nothing rich about this process of taking away a wealth of nutrients and leaving a poor imitation; there are dozens of vitamins and minerals in the original grain and only a few are replaced. Those that are replaced are usually lab-created versions that our bodies cannot absorb as well and they do not have the co-factors found in the original form that would afford full nutritional benefit. In fact, they can even cause some harm to people with sensitivities. Flour is rich in B vitamins that work together in harmony and balance. The “enrichment” process adds back some synthetic B vitamins that then require the body to re-balance what is already present with what has just been added. The result can be a B-vitamin deficiency. If severe enough, it can manifest as insomnia, heart palpitations, muscle tenderness, fatigue, anxiety, depression or poor memory. Manufacturers do this because the stripping process leaves flour with a finer texture, increases its shelf life and decreases its attractiveness to bugs. But if a bug won’t eat the flour because there is nothing to sustain its life, why should we consume it? The original whole grain is also rich in fiber, which helps sweep waste out through the colon; the refined version has no fiber. If you want to try a science experiment, mix about a quarter cup of flour with four tablespoons of water and see what you get: The perfect white glue paste. Now consider what happens as that travels through your colon. That waste is hard to remove, especially if, like the typical fiber-deficient American, you do not have a bowel movement after every meal. Much of that waste will remain in the body creating the perfect environment for parasites to thrive on as well as adding some extra pounds. But many people love bread, so how can we still enjoy it while minimizing the damage to our health? The first step is to get rid of the dangerous additives like partially hydrogenated oil and high fructose corn syrup. If you can only do one thing, read the labels and find a bread that does not contain those additives. In a typical grocery store, that may not be an easy task! You may need to ask your market to carry breads without these additives. 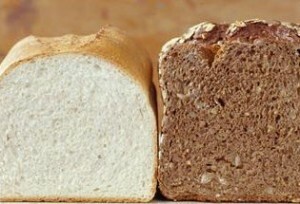 The second step is to reduce or eliminate white flour breads. (Ideally this can be done in conjunction with step one, but I separated it for those who may feel overwhelmed and want to move slowly toward these changes over time.) If you can’t eliminate it completely, try to cut down to two to three white bread portions a week. When you do eat it, always eat it as part of a balanced meal with proteins and healthy fats. Read the labels of the products you buy and put back anything that says enriched flour on it. Look for a true whole grain product. Be aware that most whole wheat breads are nothing more than enriched white flour with caramel added and are often no better for you than white bread. You want whole grain, (100% whole wheat is fine), but read the ingredient label not the marketing slogans and look for 100% whole grains. Multi-grain combination breads are also good. Keep in mind that true whole grains will lose their nutritional value within days of grinding, so they need to be consumed quickly or frozen. Making those changes will take your bread from being an unhealthy addition to your diet to one that can be a neutral element when consumed in balance. But if you want to take it to the next level, and make your bread something that can actually be a part of a good healthy diet, consider moving toward sprouted grain products. All grains, nuts and seeds contain something called phytic acid, which blocks the absorption of minerals. In addition, grains have enzyme inhibitors and compounds that can irritate and inhibit digestion. When grains have been used traditionally, native peoples knew that to avoid these problems, grains needed to be soaked and sprouted. This process not only eliminates the phytic acid concerns, it increases the nutritional value. The only bread in my house is Ezekiel bread, a dense sprouted grain bread. I keep it in the freezer and use it for the kids’ sandwiches for school. By the time the kids open their lunch bags, it’s thawed and ready to eat. If they want it now, we toast it. It has a chewier texture and richer flavor that can take some getting used to if you have lived on white bread, but once you get used to it, you’ll find white bread uninteresting and bland. You can get Ezekiel bread (and English muffins) in the freezer section of the organic aisle at most grocery stores; I get mine at Hannaford. It’s also available at Whole Foods (in the freezer) and Trader Joe’s in the bread section. Some other healthy options include Alvarado Street Bakery and Shiloh Farms Bakery, which you can find online. And if you need to be gluten free or want to reduce gluten, Cybro’s makes gluten-free sprouted-grain breads and you can find them online, too. If you look around, you’ll find many options in your local organic markets and you’ll likely find local organic bread makers nearby as well. If you are a baker, you can look for whole grain and sprouted grain flours or try brown rice flour. I do not have any white flour in my house: If I bake, I typically use brown rice flour, which doesn’t spike blood sugar levels like white flour or a Bob’s Red Mill flour such as Millet. I find them easily in the organic section of any large supermarket. You may be ready to make a big change and jump to sprouted grain products immediately and if so, that’s great. But if traditional bread is a passion, you don’t need to give it up completely. Keep your favorite staple, try to cut back on the frequency, eat it in balance with fiber, protein and healthy fats, but add some healthier options in as well. Experiment with different types of breads, and slowly try to move toward healthier choices. You may just find that as you experience the richer flavors of whole and sprouted grains, your taste for the white flour products will dissipate over time.